Dalmatian Welfare » Are you looking to adopt from us? Are you looking to adopt from us? Take the time to carefully consider the challenges in owning a Dalmatian particularly if you haven’t previously owned one before. Dalmatians are not ‘spotty Labradors’ and as a breed they may not be suitable for you and your families circumstances. If you feel that a Dalmatian is the breed for you, please call our Adoption Coordinator on (07976) 360468 or email us via the website. The Adoption Coordinator will have a chat with you, explain the process of adoption and assessment. If you are still interested we will send you our adoption assessment form. Once you have completed this form and returned it to us we will arrange for one of our experienced volunteers who lives locally to you to visit you at home. We rely on the good will of experienced volunteers who often have full time jobs so it may take a few days to arrange a visit. To avoid anxiety and stress for the current owners and their dog, their pet in most cases will remain in his or her home with them, for the dogs family it may very difficult to rehome their very much loved family pet after having him or her for several years. Therefore it will not be possible for you to meet a dog before you have it. The dog could also be living hundreds of miles away from you so it might not be practical either. That’s why we will ask lots of questions about you and your family before you adopt a dog from us and likewise we do the same with all the dogs we vet before we rehome. The ‘matching process’ of ‘dog to family’ is therefore vital and the rehoming coordinator will offer you the dog that fits your circumstances but more importantly the dogs’ needs will be paramount. We do not offer you the ‘next dog on the waiting list’, because dogs come from many different back grounds and families – our aim is to have a successful rehoming of a dog that suits it and your family. If you do not feel you could take a dog from us that you do not meet before you agree to have it then we suggest you visit one of the many dedicated pet rehoming centres. There may be a wait or we may already have a suitable dog for your needs and lifestyle. 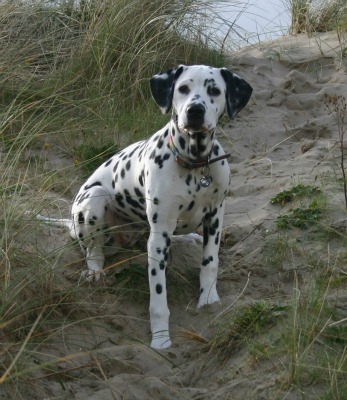 All dogs are assessed by our volunteers, many of whom are experienced Dalmatian owners. Most dogs come from really lovely homes where they have been well socialised and looked after but due to no fault of their own due to relationship breakdown, loss of the family home, change of work patterns, illness or owners death they now need to be rehomed. “How much do you charge”? When thinking about adopting a Dalmatian or indeed any breed of dog you need to consider the following; A Dalmatian will require good quality food low in purines, insurance to cover illness or injury and the associated costs of kenneling/dog sitters/collars/leads/toys/treats/bedding etc, etc. If you take on a young dog these costs could be for twelve-fourteen years or more. Realistically can you and your family afford the costs involved with owning a Dalmatian? We receive lots of money from our amazing donors and our committee and supporters work hard to raise funds across the country and throughout the year. In the past few years we are increasingly being left money from supporters estates which can really support our work and we have been amazed at how generous our benefactors can be. Our main source of income day-to-day comes from donations paid by our adopters. Typically we charge £150 for an adult Dalmatian but we may ask more for puppies under six months of age. We may waive any fee for older dogs, this is to reflect the fact there may be higher insurance and/or medical costs associated with owning an older dog. We always recommend that adopters get their dogs insured. We can support dogs with existing, chronic medical conditions, but like any pet owner we expect that food, vaccinations, worming and new conditions will be paid for by any dogs adopter. We ask that vet fees for existing conditions are discussed between our re-homing coordinators and your vet. We often find significant savings can be made by adopters paying for prescriptions and then purchasing specialist diets, drugs and treatments on-line. Please understand that we are a small charity and our resources are finite. Once you have completed and returned our assessment form our adoption coordinator will allocate an assessor to come and visit you. They may bring along a Dalmatian! Depending on your location or availability of assessors this can sometimes take a while to arrange. Once we have the report from our assessor our adoption coordinator will pass on your information to our re-homing coordinator. Please note it is the re-homing coordinator that holds all the information on our dogs waiting for homes.